I started watching Dark Shadows, again. For those not familiar with the show, theme was gothic and the format a soap opera; the story line was of a New England family tormented by ghosts, goblins and the like. 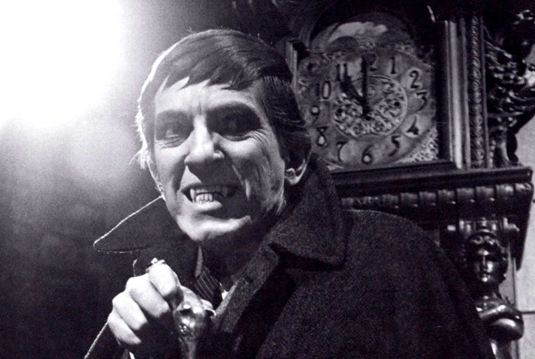 Dark Shadows aired daily for five years, 1966 to 1971, and starred Jonathan Frid (above); Abe Vigoda co-starred in three episodes, Harvey Keitel in two episodes and Marsha Mason in one. Although not a live show, it was live-to-tape, with remarkably few re-takes. The show quickly developed a cult following. Dark Shadows was popular with kids and teens. It had ghosts, werewolves and, most importantly, Barnabas Collins, the vampire, portrayed by Jonathan Frid. As a kid, I found the show so cool. Now, watching it as an adult, I often laugh at the goofs and flubs the cast and crew sometimes made. You see, with the show on five days a week and a low budget, they didn’t have time for re-takes. It made me think of live theatre, why I love it so much. When you’re acting in front of an audience, pretty much anything can happen. You must be prepared to react, appropriately. Over the years, both backstage and on, I had several interesting episodes. One time, running lights for Roberta, I heard the lead actor jump ahead on a line and it was an important one too. He told his girlfriend he was going to Paris to see his Aunt Roberta something like a full page ahead of when he should. Here’s the critical issue. Their entire conversation was her pressing him to reveal that fact. Jumping ahead meant the characters essentially had nothing to talk about for the next few minutes. Some actors can deal with that sort of situation, they’ll adlib something, mention another character; heck, they’ll talk about the weather. Unfortunately, these two actors were not good at adlibbing. It was the longest minute in theatre history! Salvation came in the form of the lead’s best friend. He was supposed to come on at the end of the scene and announce it was time to go. He jumped in much sooner than normal and then the stalled actors recovered. For myself, I’ve always done well at remembering my lines. In fact, I usually knew the whole show by opening night, which came in handy. If one of the other actors “went up,” meaning he or she messed up or forgot a line, I could feed them the correct one and we’d get back on track. A memorial on-stage mix up. Ah, but there was one time when I truly had to be creative. I was doing Inherit the Wind and playing the judge. In the final scene, a radio reporter and I come on stage. I show him where to set up his microphone. One performance, the reporter couldn’t find the microphone; someone had stuck it in a closet or something. The actor, portraying the reporter, is dashing around backstage, I’m waiting to go on and the two main characters are onstage doing their opening scene. When they finish, the reporter and I are supposed to enter. Well, the two main characters finished their scene and the reporter still wasn’t there. I walked on. The expressions on the faces of the two main characters almost made me laugh. They were quite surprised. Although, not half as shocked as when I walked over and started talking to them! The characters were Bertram Cates, the defendant, and Henry Drummond, his attorney. I chatted about the trial, congratulated Henry on his defence and wished Bertram a good life with his fiancée. The two of them sat there, dumbstruck, mouths hanging open, and never said a word. That was the toughest flub. Out of the corner of my eye, I saw the two other actors nod; I grinned. Yeah, they’d figured it out. Not the first or last flub in a play I had to deal with, but surely the toughest!